Today marks the 6 month anniversary of our mission in Romania. In the true missionary spirit and upholding all tradition, we burned a tie and pantyhose near the garbage chute of our apartment. You can tell by the smiles on our faces...it was WAY fun! We love our mission. We are constantly amazed at the experiences we're having and we are so thankful we made the decision to serve. It has been the hardest and best thing we've done together. A sense of humor is essential and we're glad we have each other to laugh at our predicaments. Just this week we got caught in a surprise downpour on the other side of the city. We actually fished an inverted umbrella out of a garbage can and re bent it to make do! HAVE YOU EVER DONE THAT? And to think we could be golfing! The flaming tie and pantyhose. One thing we have learned is how to eat anything, almost! We can't bring ourselves to eat CRAP (yet)! Today we saw our first leaves and had to get a picture. Spring is finally here. Families were in every playground we passed. These are Easter baskets with real fur stuffed bunnies. The old men love spring almost as much as the children. Minutes after we took this picture a shouting/shoving match broke out. Guess it wasn't check-mate! We couldn't resist snapping this shot of Violet! We have seen every hair color but this is a do just in time for Easter. Here we have "one-stop-shopping"...workout, eat, and get your oil changed...while you wait! If you park in a no-parking zone you risk becoming victim to the "tow crane sting". Six of these cranes work in unison to clear a line of cars in about 20 minutes. This week we delivered a wheelchair to a young man the missionaries are teaching. Elder Clonts instigated the delivery and he was the most excited! This is Adrian. He has a rare bone disorder that over time has deformed his feet and legs. 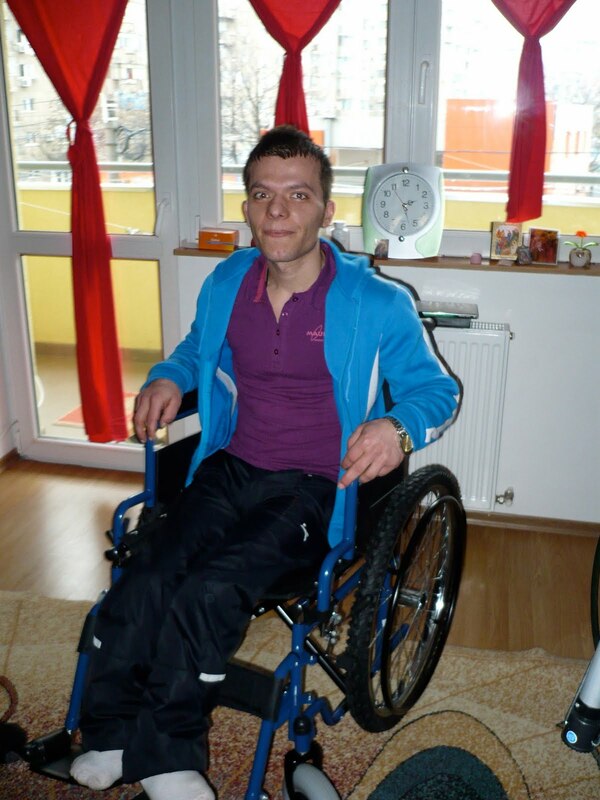 He has been waiting for a wheelchair from the government for 5 years. This is one happy young man! 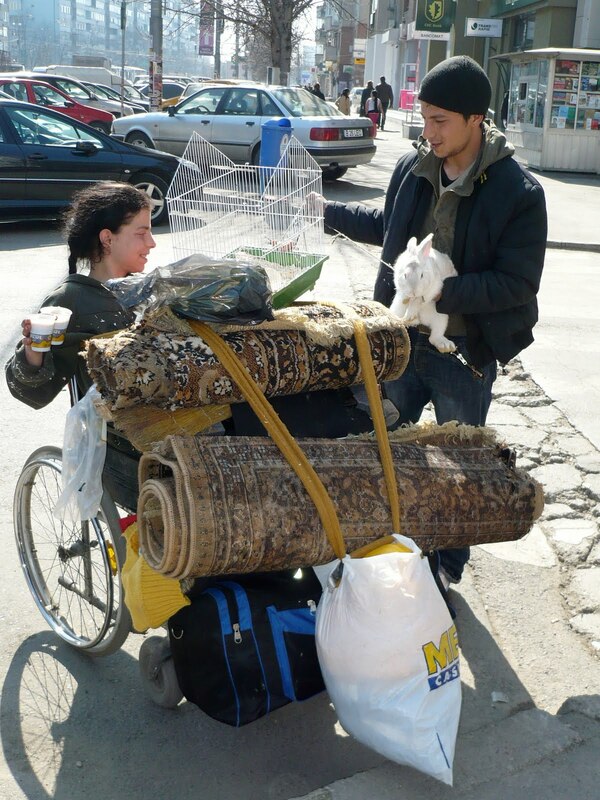 We attended another wheelchair distribution 2 hours outside of Bucharest. This has become one of our favorite activities. Nothing beats watching the smiles on these faces. This is an authentic craft fair. The artisans actually make things in front of you and then you buy the thing! This cute little lady was spinning wool. 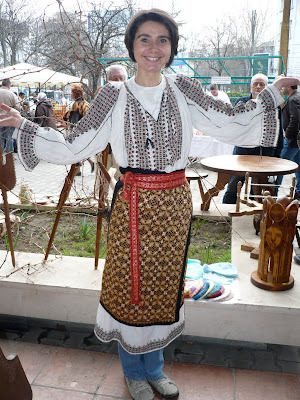 This girl was buying an authentic Romanian dress and showing us how it all went together. We all bought one! She was darling and so nice. And finally...the last picture is a doozy. We were telling our wheelchair specialist from Salt Lake that we had never seen a wheelchair on the streets of Bucharest in the 6 months we have been here. Finally, the snow melted and the first one appeared just this week! It's an all-purpose model that doubles as a truck and a small animal transporter. All we can say is...if this girl has legs under this load, they're probably crushed by now and she really needs a wheelchair, with cup holders! We heard that Spokane is hosting the first round of the NCAA Tournament. This thought crossed our minds last night as we were held captive on a 10-hour night train from Arad to Bucharest. March Madness has taken on new meaning! Our escapade began quite innocently. We had promised to visit an organization 300 miles away and planned to fly until we priced the tickets and realized our budget would not allow such frills. Plan B was the night train. Sleeper cars are decent and if you go 1st class, you are assured a private room for two (rather than a private bed with 6!) Unfortunately, the return trip sleepers were sold out. and we were forced to endure 10 hours of pretend sleeping with characters we can't begin to describe. The outbound trip to Arad was delightful punctuated by pressed sheets, fluffy pillows and a private sink to freshen-up. After our business meeting, we boarded the train in the evening and settled in our 1st class compartment thinking we would be just fine in an upright position all night. After all, haven't we all slept sitting-up on airplanes? First one in our cabin was a nice man who made himself at home immediately. Denny was a good sport as his sleeping partner nearly used him as a pillow! Move we did! We found seats in the open section. By this time we were really having a blast! If this looks miserable, it is because IT WAS. We arrived back in Bucharest at 5 a.m. armed with the resolve to never, ever take a night train again without the benefit of a private sleeping cabin. Yet another lesson in the Linerud Book of Live and Learn! This is our version of March Madness! Did we say we love this mission? Okay...let us get a nap first! 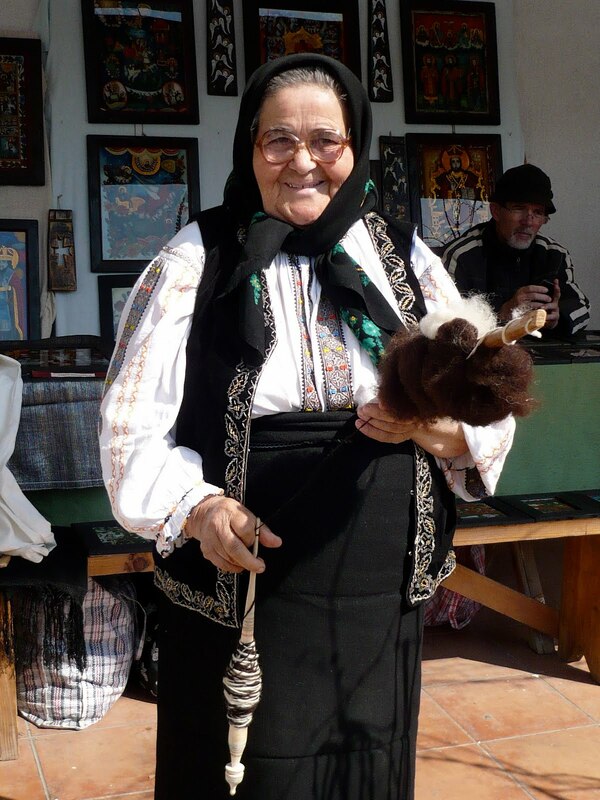 The Church membership in Romania is small but growing. By last count, it is approximately 2300 members. In a population of 23 million, that is less than 0.01%. In contrast, 86.8% are Orthodox. We have our work cut out for us. If you ask a Romanian on the street what he believes, he will say he is Orthodox and he believes in Jesus. Beyond that, most know very little about their religion and very few actually go to church. When they open their hearts to the message of the restored gospel, they are elated and wonder where the Church has been all their lives. We need more trumpets here! President Lundberg, our Mission President, has challenged the missionaries to stretch themselves by teaching at least 20 lessons a week and ultimately bringing to baptism 200 in 2010. This is huge since our baptisms in 2009 didn't quite reach 100. President and Sora Lundberg are so full of faith that they completely believe we are due this miracle. So far, baptisms for 2010 are at 19 with 19 more dates set. We are in the middle of a miracle and we love it! President Lundberg also shared with us another miracle. He said that through the inspired efforts of parents of one of our missionaries, the Romanian ambassador to the United States paid a visit to Utah a couple of weeks ago. He and his wife visited BYU, the University of Utah, Temple Square, Welfare Square and the Family History Center. They were very touched by the spirit they felt during their visit and were so impressed with all that they experienced. The ambassador indicated that he would work to open the way for members to research family history information in Romania. It would indeed be a miracle if his visit ultimately resulted in the Church being able to gain access to the vital records in Romania. Denny is on the District Council (High Council) and as such, has speaking assignments in the area. Here we are in front of a villa which is where church is held in the city of Alexandria. We attended the baptism of Emil, one of our newest members. He met the missionaries in Cyprus 10 years ago. He couldn't speak Greek and didn't speak English well enough to be taught by the missionaries. The missionaries did give him a Book of Mormon, which he read before returning to Romania. 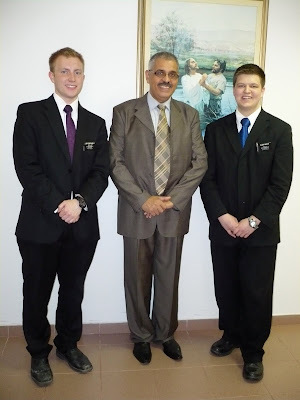 Three weeks ago he noticed two clean-cut missionaries and remembered the tags of the two Elders in Cyprus. He said he sprinted across a plaza to reach them and breathlessly asked to be baptized. Emil will be a great strength to the Church in Bucharest. His son is a Priest in the Orthodox church and has been very supportive of his father's decision to join the Church. President Lundberg said in our last mission email, "It's almost daily we hear of instances of people approaching the missionaries and wanting to know more." On the same Saturday, we traveled across the city to attend the baptism of DeDe and Beatrice, a mother and daughter who also were so excited to hear the Gospel. And finally, because we are humanitarian missionaries and mostly because WE ARE CHRISTIAN, we "Because we have been given much..." gave away this wheelchair box to a family living through the winter in this van. We were on our way to the dumpster by the church and thought they could use our "gift". We saw a toddler playing inside earlier but when we knocked on the "door" no one answered so we can't report on their jubilation! It has been a lively two weeks and we apologize that our expected blog has taken a back seat. Ask any missionary and they will tell you that a happy missionary is a busy missionary. We are euphoric! We have spent the last nine days with our new friends, the Jacksons, sent to us from Salt Lake City to give us direction developing a wheelchair project. Their official title is "Short Term Specialists" and they travel from their home in St, George all over Europe to develop projects. When a very complicated project is launched, the Humanitarian Services of the Church sends out back-up. This tactic helps to prevent humanitarian missionaries from jumping out of windows or taking up drinking (a bad example for a missionary). The Jacksons are "know-it-all's", and we mean that in a good way! For those of you wondering what we are doing in Romania, here is a short expounding on how the Church gives away wheelchairs. Since 2001, the Church has distributed more than 300,000 wheelchairs, worldwide. We will help to distribute 750 in Romania in 2010. We offer a variety of wheelchairs, depending on the need, from "pushers" like you would see in hospitals to "rough terrain" that would be self-propelled over curbs, cracked streets, and tree roots. Wheelchairs are shipped in and then consigned to a Non-Governmental Organization (NGO) for final distribution. This is where we come in. Our job is to find a great organization that shares our goals of self-sufficiency and a list of other virtues. We work closely with this NGO from assisting in securing the shipment papers to final distribution to the disabled individual. Getting the right wheelchair to the right recipient is of utmost importance. The project we developed with the Jacksons involves importing 250 specialty wheelchairs and organizing a three-day training workshop where Physical Therapists from the US will train Romanian organization representatives to properly adjust and prescribe wheelchairs. The training will take place in Cluj, about 300 miles from us and is scheduled for the end of August. Every detail of this shipment and training was worked out over the last nine days. Here we are with Doug and Delene Jackson. They are amazing (and very spunky, for their age!). This is what our dining room table looked like for a week. 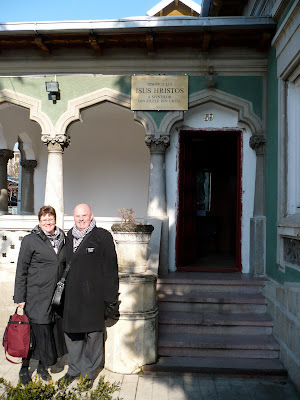 Here we are visiting our Partner and NGO in Cluj. Sally Wood-Lamont will import the wheelchairs. Doug Jackson is explaining a Power-Point. Wheelchair users are a great resource to increase our understanding of what is needed. Mihai was involved in all our meetings. This is another meeting that was held in Turda to discuss what was needed by the disabled. Our translator, Aura was a valuable addition to the meeting. This is Cristian Ispas, one of our trusted NGO's who is currently distributing a shipment. Here we are posing in front of Motivation Romania, one of our partners. Did I mention that the Jacksons made this whole experience a barrel of laughs? It' true. As the grand finale, a blizzard blew in for the final two days of the Jackson's visit. They loved it! Delene had a good excuse to buy new boots and Doug learned the fine art of "scarf-wrapping". After the Jackson's left, we finalized the project and submitted to to Welfare Services in Salt Lake. Then, we went to bed early! Countless hours discussing the details. We generated 120 emails, ate 3 loaves of bread, cheese, crackers, salami, chocolate, and an undisclosed number of liters of Neagru Elixir. We had a blast and we would do it all over again, but only with the Jacksons! This is our Mission! We love being here. We love the people. We love being Humanitarian Missionaries. P.S It snowed another 5" yesterday. It's MARCH, for Heaven's sake!